Serving up Italian breakfasts, early morning cocktails and eight types of regional pastas on Flinders Lane. There's never a bad time for Italian cuisine, whether you're tucking into a breakfast jaffle filled with truffled pecorino and Tuscan kale, treating yourself to a salumi plate for lunch, or devouring a hearty dish of eggplant and almond ravioli for dinner. They're all on offer at Melbourne's newest Mediterranean eatery, Lello Pasta Bar, which spreads its regional cuisine across its all-day menu. 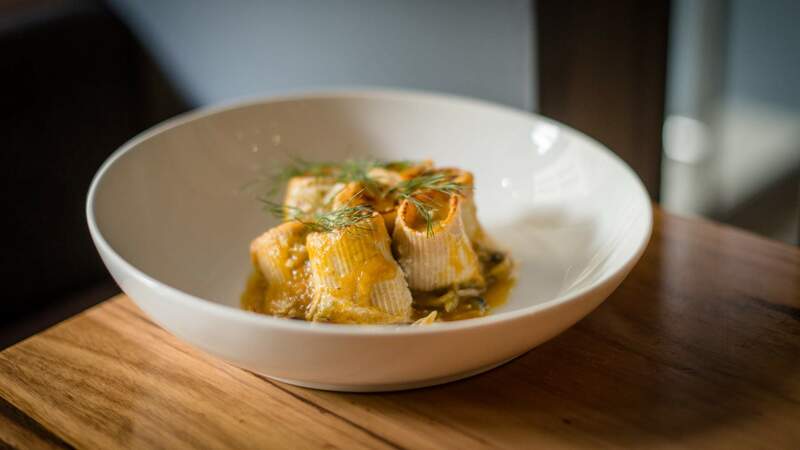 Setting up shop in Flinders Lane, Lello proves a case of familiar site, new focus, in what the venue is calling an evolution Yak Italian Kitchen. Head chef and co-owner Leo Gelsomino is now taking inspiration from the wealth of dishes Italy has to offer, blending it with a homely vibe and serving up the kind of fare likely to make you dream about a European holiday. Early morning offerings from breakfast chef Julie Touma (ex-Swing Bridge Café in Lorne) include stracciatella with roast pumpkin, poached egg, pumpkin seed granola and a grilled baguette; coddled eggs with house smoked ocean trout, kohlrabi remoulade and toasted sourdough; and herb and parmesan frittata topped with brown mushrooms. Grab a Heart Starter Pear Tree martini to go with them, with the blend of pear-infused vodka, St Germaine Elderflower liquor, lime juice, angostura bitters and cinnamon recommended with breakfast. Gontran Cherrier pastries, takeaway baguettes with daily-changing fillings and Atomica Coffee are also on offer, as well as English muffins with buffalo ricotta and wellington honeycomb. Those stopping by for a midday or evening spread will find five types of antipasto, such as stuffed calamari with mussels and warm artichokes with liquorice brioche, eight homemade pasta dishes, and both fish and chef's plates of the days. Given the eatery's name, it should come as no surprise that their pastas will tempt your tastebuds — think potato gnocchetti served with scallops, asparagus, peas and vermouth; a veal, pork and spinach traditional lasagne that hails from the Ferrara region; and slim candele tubes with chickpea, homemade spicy pork liver and orange sausage. Desserts range from wild fennel ice cream to sweet cannoli to the old favourite that is tiramisu.